8″ diameter inlet valve with bulk/dribble controls for accurate weighments. Power-Lift™ fill head height adjustment provides bag size flexibility and enhanced access for bag connection, and removal of filled bags. Power-Sweep™ system extends bag hanger and fill head towards operator for reach-free bag attachment. Easy-Load™ bag hanger system rotates allowing operator to load bag while standing in one position. Inflatable USDA/FDA approved spout seal supports and seals bag inlet spout. Loop-Lok™ powered bag strap release system. Electropolished stainless steel product contact surfaces, welds polished smooth. 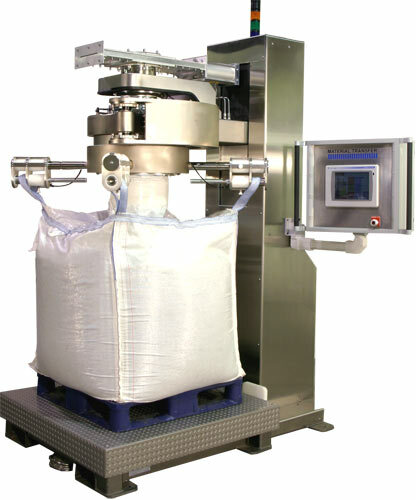 Bag densification with scale isolation system. Dust take-off on inlet tube. Allen-Bradley PLC with PanelView Plus touch screen operator interface.